· It took three freedom of information requests to obtain the study protocol that was barely 7 pages long*. · The triallists had specified from the outset that informed consent would not be sought, i.e., there would be no explicit check that women presenting for screening fully understood the risks. · The Principal Investigator of the study is not a scientist or doctor, but has a degree in Ancient History and Classical Civilisation and her medical doctorate and professorship are both honorary. · The proposed trial was implemented without having been properly peer-reviewed. Instead of receiving independent academic and scientific scrutiny it was passed by an internal Department of Health committee. · No body appears to admit full responsibility for the scientific content and oversight of the trial. In responses to letters inquiring on this question, it seems to be passed around between the AgeX investigators, the sponsor (Oxford University), and the Research Ethics Committee (REC). Cost of extending the NHS breast screening age range in England published online by BMJ today, 10 April 2019. ‘Thousands of unnecessary mastectomies may have resulted among women persuaded to take part in the government’s AgeX study, claims a report by HealthWatch experts published today in the British Medical Journal. The study, announced as “the biggest randomized controlled trial in history”, has already invited over a million women to undergo mammographic screening for breast cancer without first checking they understand the test could harm as well as benefit. Exposed by HealthWatch: the bad science and unnecessary surgeries behind the six million women NHS cancer screening experiment. Wednesday, 10 April 2019. 1 Should GPs be paid for increasing breast screening take-up when the Marmot Review found participants were 3 times more likely to be harmed than to benefit; the Parliamentary Review echoed the same findings; and neither included all cause mortality ie deaths caused by treatments/screening – etc.? 2 Excluding GP payments, is it ethical for GPs to advise women to go to breast screening when many of them do not understand the research findings – or, if they do understand the serious harms and lack of benefit, do not get screened themselves? Writing in the BMJ ( BMJ 2019;365:l1409) Helen Salisbury explains the dilemma faced by doctors. ‘… I have a problem with breast cancer screening. The evidence for its benefit is very much less clear. There are well known problems with lead time bias, overdiagnosis, and toxic treatments of screen detected “cancers” that would never have been clinically relevant. People need to be able to trust their doctors. HealthWatch-uk.org is a registered charity (No.1003392) which has been promoting science and integrity in healthcare since 1991. PLEASE NOTE: HealthWatch-UK is not connected with the (later) NHS organisation, ‘Healthwatch England’. The government requires energy suppliers to offer smart meters to all small businesses and homes by 2020, so it was understandable that my electricity supplier, nPower, had contacted me about this. But Smart meters are not a legal requirement – it is not compulsory to have a smart meter installed. Nevertheless, someone had decided they would come and fit one in my home! It was the second such unsolicited letter and, shockingly, it not only asked me to confirm the installation appointment and suggested I should get in touch with the power organisation if I wanted to change the time or date, but required me to call them within the next 5 days to do so. However, it did not mention that I could decline the offer. (And the onus should not be on me to respond about an appointment I had not requested.) A separate, coloured box nudged me to ‘Please act now – confirm or change your appointment’. To me, any unsolicited mailing of an appointment which has not been agreed to (including unsolicited breast screening appointments) is unethical; also, it could cause stress, especially to vulnerable people, regarding decision-making, the need to make contact and difficulties in declining the ‘offer’. I tried to telephone the company but was put ‘on hold’ along with canned ‘musak’, so after a while I rang off. An attempt to decline online was similarly unsuccessful, as the list of issues I was asked to choose from before writing a message did not include a refusal. Finally, I sent an email complaint. Such an unsolicited appointment letter was surely ‘lying by default’ (ie giving the impression Smart meters were a mandatory requirement). Intentionally misleading messages which give no opportunity to decline an ‘offer’ are as much a scam as any other which tries to hoodwink the public in order to achieve an objective. Later that day I received an email telling me ‘the smart refusal has been added to your account, however we are unable to confirm the date that this was added to your records. This will prevent any further correspondence being issued for smart meters. Due to the level of service you have received and for the inconvenience this has caused you, I have arranged for a goodwill gesture of £10.00 to be credited to your account.’ This merely added to my frustration and distrust about the whole business. I wanted to stop what I believed to be sharp practice. The Ofgem website informed me that it did not get involved in disputes and offered links to the Citizens Advice Bureau and the Ombudsman, but advised taking the issue to one’s energy supplier first. Breast cancer (and other cancers) – can this pill save lives? I don’t usually share information about so-called cancer ‘cures’, but the possibility that surgery, and even fine needle biopsies, could prompt cancer spread has interested me for many years. So when I came across this blog and understood the scientific reasoning behind the hope, I felt it could be important. “About ten years ago, an anesthesiologist named Patrice Forget, MD, PhD (pronounced “For-shay”), of University Hospital, Brussels, compared the cancer recurrence rate of 327 women. All the women had received one of four different painkillers during their surgery for breast cancer. Dr. Forget found something astonishing. There was a greatly reduced risk of a distant relapse among breast cancer patients who got ketorolac. This was compared to patients who received the three other non-NSAID painkillers. They got no such benefit. The blog goes on to explain how the pill works by reducing systemic inflammation and so preventing the growth of new blood supplies to micro-metastases and stopping the growth of a new tumour. Is it proven too work? Two retrospective studies have shown and a 41% and 45% reduction in the risk of distant recurrences. “These two studies show “a definite benefit of perioperative ketorolac in breast cancer,” according to Dr. Michael Retsky of the Harvard School of Public Health. The ideas have been put forward in a medical textbook by Michael W Retsky and Romano Demicheli: Perioperative Inflammation as Triggering Origin of Metastases Development, Springer. Please note – further clinical trials are needed before any definite benefit of ketolac as an anti-cancer drug can be proven. Includes referenced discussion sections for evidence-based practice. 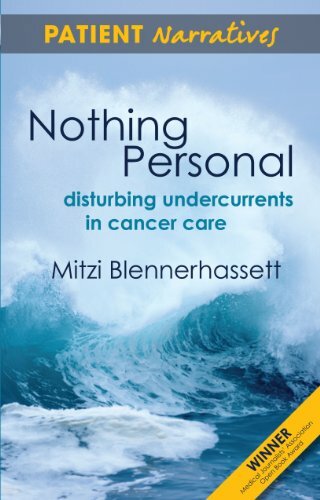 "A landmark for the patient voice"
"A remarkable book... essential reading for all who deal with cancer patients - health professionals, politicians, health service developers, carers and, of course, patients themselves... will surely inspire change." - Professor Karol Sikora in his foreword. others through times of change. creating a vision that inspires us and others to do what needs to be done.